In 1920, Bashir Sayegh began servicing the New York City mercantile trade with two horses and a flatbed wagon. Over time, he was joined by three of his sons, Louie, George & Albert. They bought their first gas powered truck in 1929; and eventually, two more were added. In the 1940’s, during WWII, the sons were drafted into the service, and Bashir Sayegh & Sons was forced to cease operations. 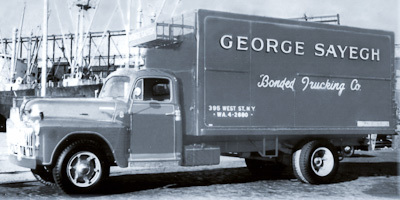 In 1945, after returning from military service, George Sayegh began what is now George Sayegh Trucking Co. 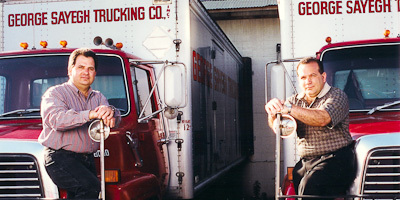 He was joined by his brother Albert a year later and together they successfully ran the company, primarily an import & export trucking business, for over thirty years. George’s sons, George Jr. and Robert took an early interest in the business. As kids, during summer vacations and days off from school, they would work as helpers on the trucks. After graduating from St. John’s University in 1975 with a degree in Business & Transportation, George Jr. joined the business full time, just prior to his father’s retirement. In 1979 after graduating from Baruch College with a degree in International Marketing, Robert joined his brother and uncle who were running the company. In 1981, with the retirement of their uncle, George Jr. & Robert assumed full ownership and operating control of the company as partners. Needing room to grow, in 1994, they moved operations from Manhattan to New Jersey and expanded into warehousing and distribution. Building on Sayegh Trucking’s extensive experience and expert knowledge of the import/export shipping process, the brothers established the logistics management practice to more fully assist customers with the management of their business’s transportation needs.